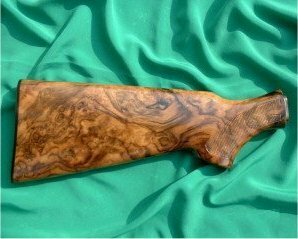 Walnut has long been the preferred wood for making gunstocks. 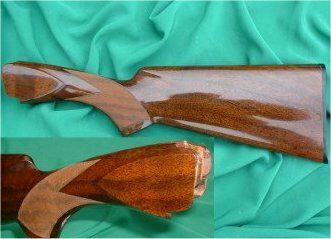 The curved grain of wood taken from the area around the base of the tree where the roots curve in is ideally suited to the shape of these pieces, and its strength, resilience and toughness help to handle the shocks of firing. Old, slow-grown trees from Turkey and the neighbouring region have a very fine, tight grain due to the difficult, cold climate and are considered the world's best for this purpose. 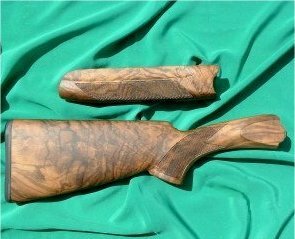 Most, if not all, old-established sites of the Royal Army Ordnance Corps have a stand of Walnut nearby, and even though modern military weapons no longer find a use for the wood these trees are a reminder of the long association with firearms.